Welcome to the Artistic Outpost Design Team July Blog Hop! 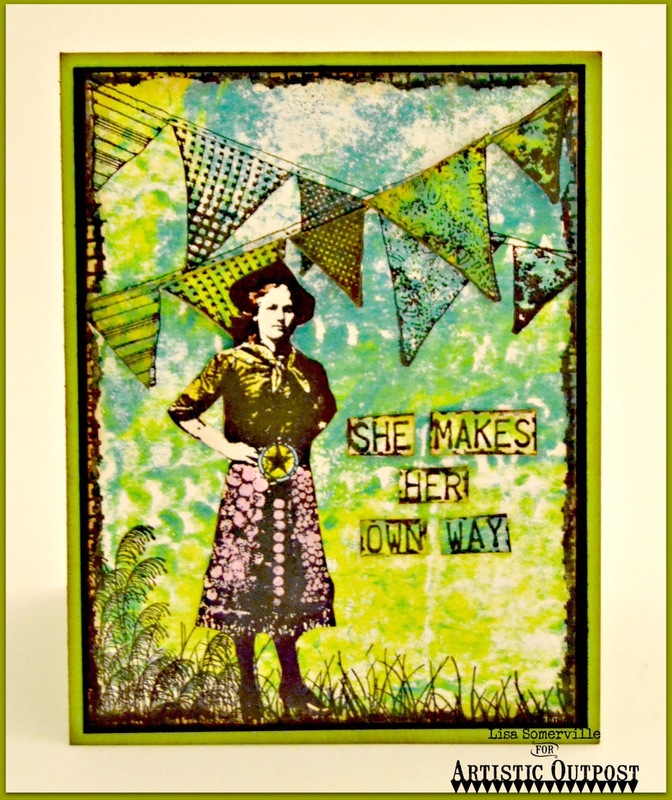 Each month, the fabulous designers at Artistic Outpost showcase projects created with various Artistic Outpost stamp sets. This month, the Designers are sharing projects they created using the AO stamp sets found in the Country Life stamp category. Before I share the details on how I created my card, I wanted to let you know that today is the last day of the Artistic Outpost Christmas in July Sale! See this post on the AO Blog for more details. 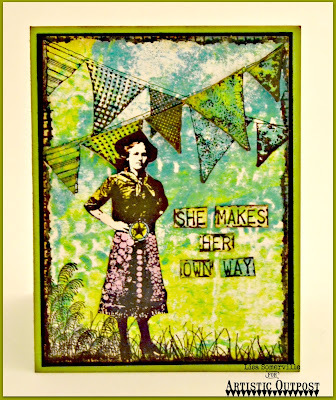 I created a Mixed Media card using stamps from the Cowgirl Strength and Keeper stamp sets. The background panel was created using the eBrush/Siphon Adapter Kit along with stencils from Latina Crafter, Dylusions paints and the Gelli Arts Plate (see this post here for more details). I stamped the grass from the Keeper set in Black Archival Ink across the bottom, and added the bunting and "stitching" from the Cowgirl Strength set, popping up pieces of the bunting. The cowgirl is stamped on White card stock, then colored with STAEDTLER Watercolor pencils, blending with Gamsol. The sentiment is stamped on scraps of the background panel, with the "stitches" stamped on the edges. Fantablous! Love the grasses from Keeper used with this set, why didn't I think of that! Great mixed media background and colors. Love the way she stands so tall and strong against that gorgeous background! Wonderful layers and so much interest! Love this card, Lisa! What a great cowgirl! love the colors you used on this! Really cool colors! Love the background!